Fabriano Artistico is available in ROUGH, COLD PRESSED (NOT) and HOT PRESSED (HP). 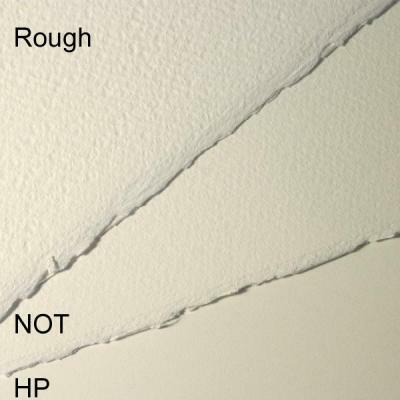 The rough is the roughest paper, NOT is a medium texture and HP is smooth. Due to surface changes in 2016 the HP may not be suitable for detailed botanical work. Please note: that if the paper is cut then there will no longer be deckled edges on all four sides. When the paper is cut, in half, there will be 3 deckle edges and when the paper is cut, in quarter, there will be 2 deckle edges.